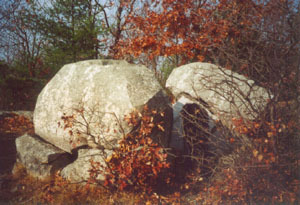 Tippling Rock sticks out above the trees in Sudbury, Massachusetts. It affords a great view of the western suburbs as well as a view of Boston. 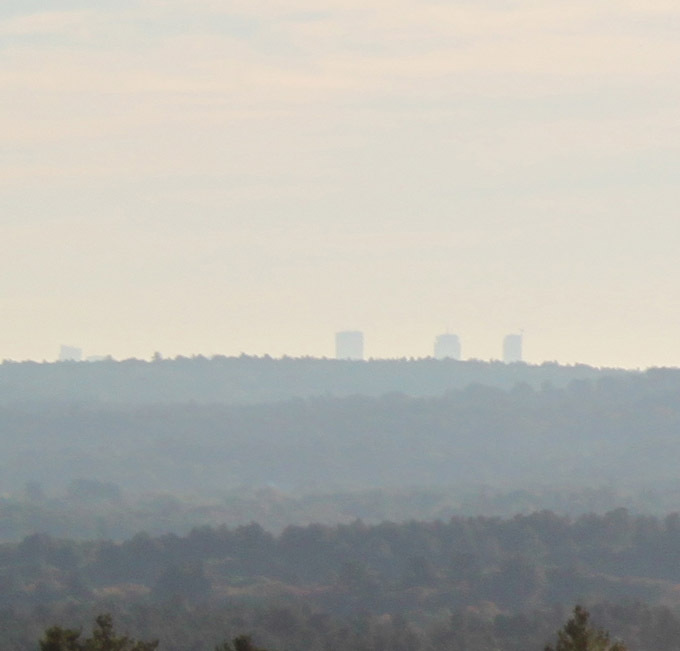 Actually, all you can see of Boston is the tops of the Hancock and Pru. 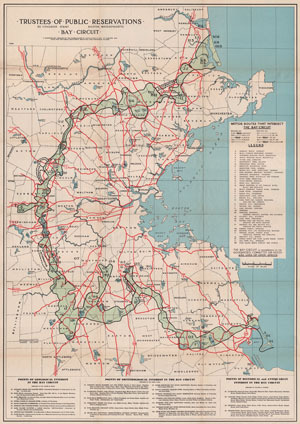 In addition, the First Parish of Sudbury, Unitarian Universalist, FP Concord on horizon, Our Lady of Fatima, Goodmans's Hill, Prospect Hill, the Radio Towers and Great Blue Hill. 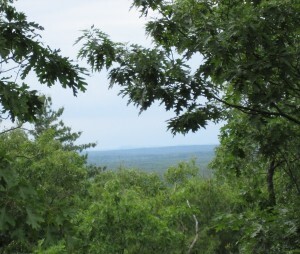 Most of the green foreground (pine trees) is on the Sudbury's Tippling Rock Trail, aka Weissblatt conservation land. 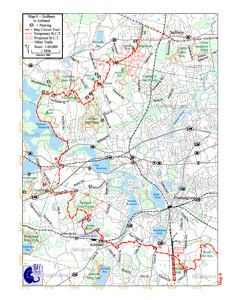 2012 Sudbury Valley Trustees produced a new hiking map: Nobscot.pdf which covers Nobscot Scout Reservation, the Town of Sudbury's Weisblatt and Nobscot Conservation Lands along with the Mass DCR Callahan State Park. There are 2 pages of descriptions and the map is 11x17 - (right). So, I doubt I will be updating my 2001 map, but, I have some GPX and KML files at the bottom of the page *New And Improved* with Ford's Folly! Note: Noscot was logged for decades and logging roads crisscross the whole reservation. This means there are many, many trails and many many chances to make wrong turns. You might think about having some GPS gizmo or App on your phone. I use Motion-X, but AllTrails or any other GPS hiking App would be fine. 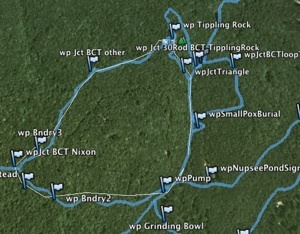 See the GPS files below. Tippling Rock is in the USGS Geographic Names Information System as a summit. 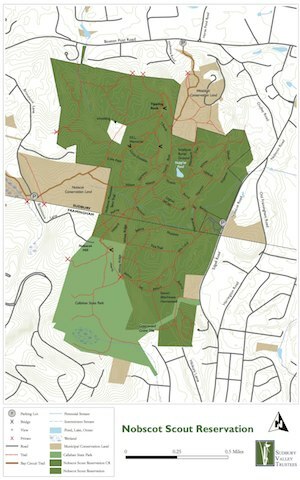 Sudbury Valley Trustees - http://www.sudburyvalleytrustees.org/ - Preserving habitats in the Sudbury, Assabet, and Concord river valleys. SVT is now the steward for Tippling Rock. Tippling Rock is in the Boy Scouts Nobscot Reservation. 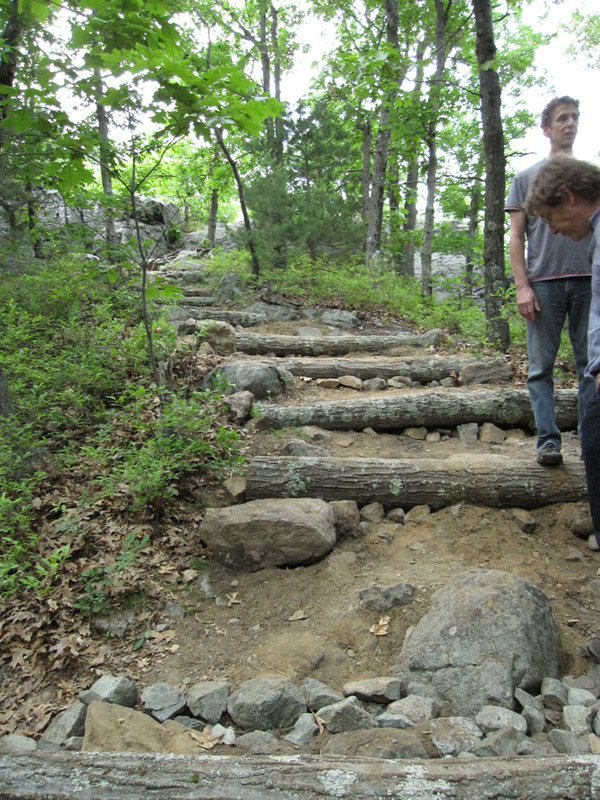 If you are on Tippling Rock or on the paths between the two Sudbury conservation parcels, you are their guest. The reservation was formerly part of the Knox Trail Council. Bay Circuit Trail - baycircuit.org This is a trail that circles Boston. Check it out! 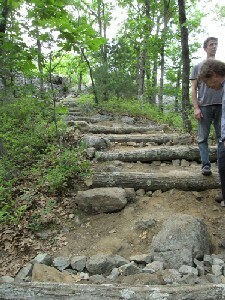 They have a nice page on Tippling Rock and Nobscot as one of the "jewels" along the trail. I can attest to there claim that in the late summer, people are occasionally allowed up in the fire tower on Nobscot, although, it was quite a few years ago when I did it. The town of Sudbury Conservation Lands includes two parcels near Tippling Rock that provide parking and lots of land to get started. 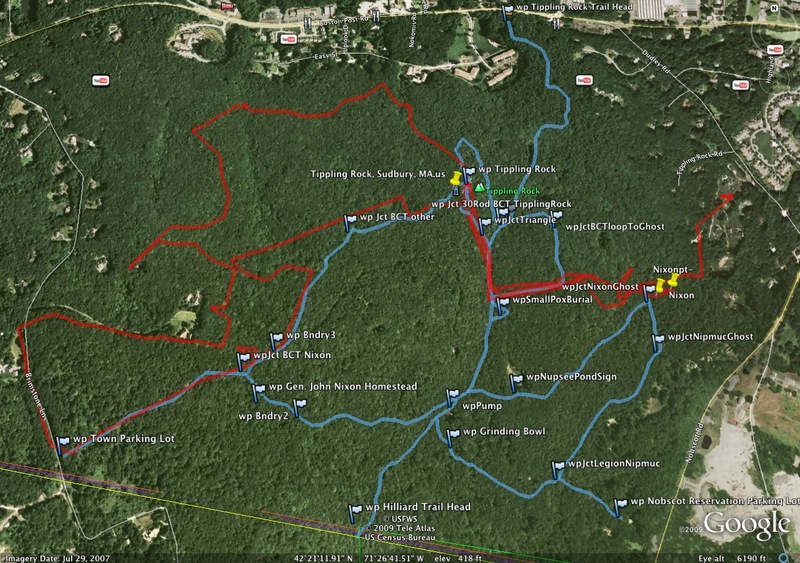 These are the Nobscot and Weisblatt (aka Tippling Rock Trail head) conservation parcels. The town website has maps that you can download. 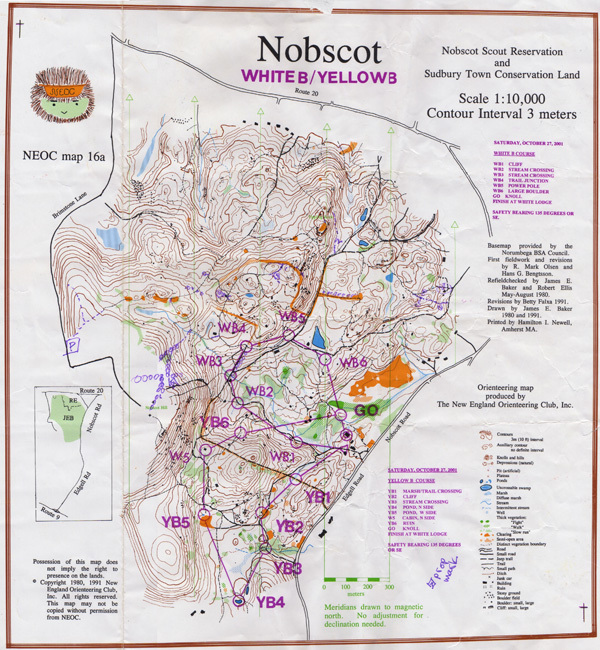 The New England Orienteering Club (NEOC) http://www.newenglandorienteering.org/ has events in the Nobscot reservation a couple of times each year. They have great maps. Allan Jung's November 2008 article in the Daily News Trubune. 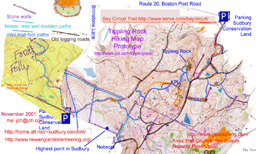 Wide ranging article includes Ford's Folly, Nupsee Pond and Nobscot summit. It has Great Pictures by Allan Jung!!! To the right is First Parish from Tippling Rock. There are two geocache spots on Nobscot. Nobscot Hill and the Wayside Inn. Why is it called Tippling Rock? Tipple has two meanings: one is a device for unloading freight cars by tipping them and the other is to consume liquor. 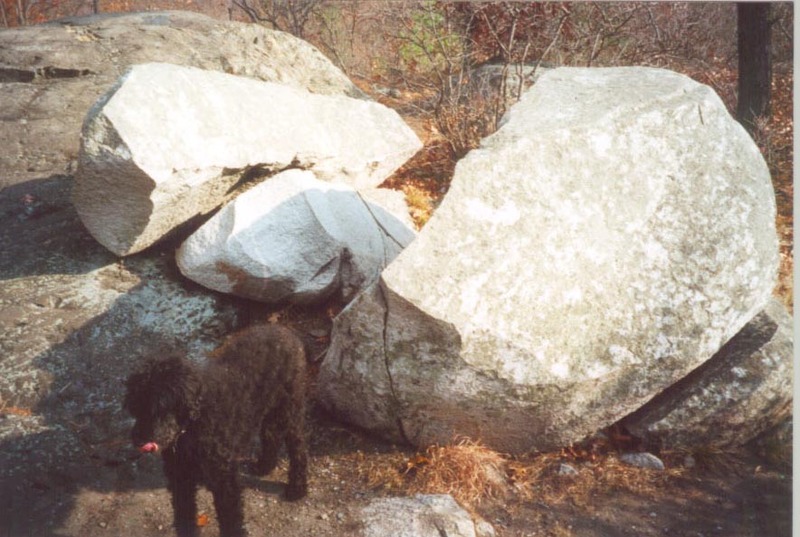 The favorite theory is that the boulder on top of the outcropping used to tipple, as in rock back and forth. One theory is that the native Americans would tipple it to send sound thru the rock for communication. These hole are clearly for "feathers and wedges" which is a rock splitting technique still used today. Holes such as these are drilled in the rock and then three components, two feathers and one wedge are inserted into each hole. The wedges are tapped down in sequence from one end of the rock to the other and back and will eventually split a granite rock such as this. When a big rock splits, it makes loud "thunk" but not a bang like dynamite would make. Holes for dynamite or various powdered explosives would be larger in diameter and much deeper. Dynamite would also leave a more fractured surface without the clean split that you see. So, was it blasted or split with feathers and wedges? Our Dog Max stands close to 3 feet tall. Click on the lower two images for larger images. 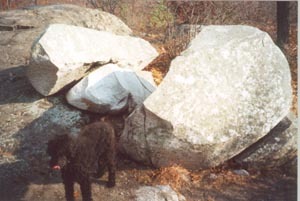 The rocky outcropping is most likely a gray limestone, but the boulder is granite. How did it get plopped on top? in this region is known as Tippling Rock. Lee Swanson of the Sudbury Historical Society said George Barton knew he was dying in 1891 and sat down and typed out his story. He mentions Tippling Rock. TODO: Check this out!!! The Tippling Rocks were used for communication - long distance. Curtis Hoffman. But in its place a waterfall. 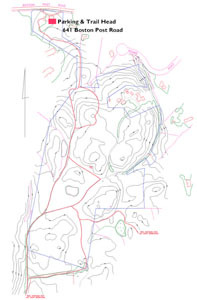 Includes Waypoints for General John Nixon's Cellar, the Small Pox Burial Ground, the Indian Grinding Stone, Ford's Folly, parking lots and major trail junctions. 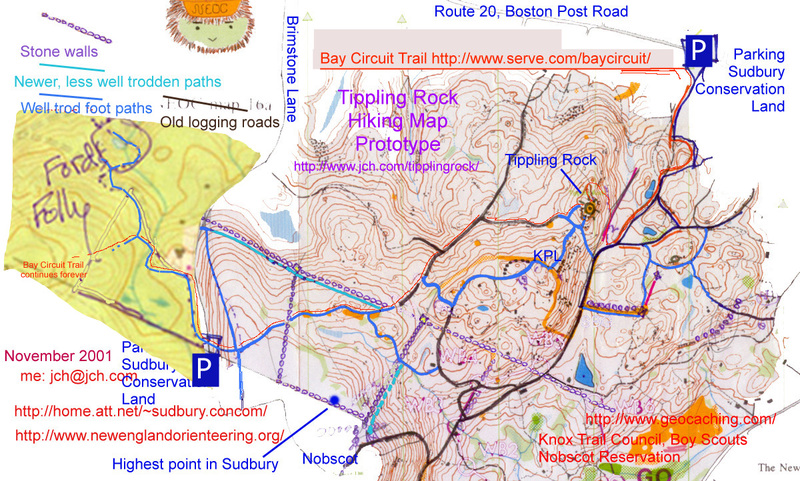 Tippling Rock, Sudbury, MA.US: Single GPS coordinate with a Viewpoint. Nobscot Hiking, View from Nobscot GPX files. They all include "Jethro's Table". This is a ledge that juts out near the summit of Nobscot. 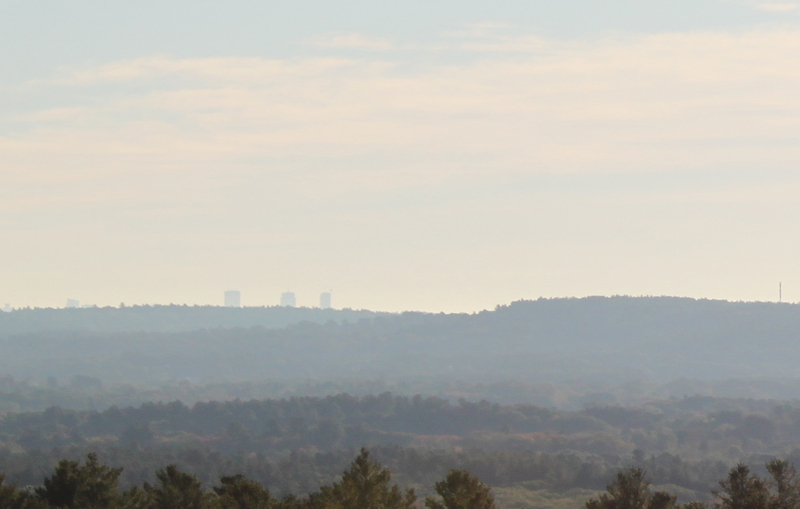 This is the best view, barring trespass to the fire tower. I cannot find any reference to the name Jethro's Table, but, I have used the name for decades and I do not think I made it up. 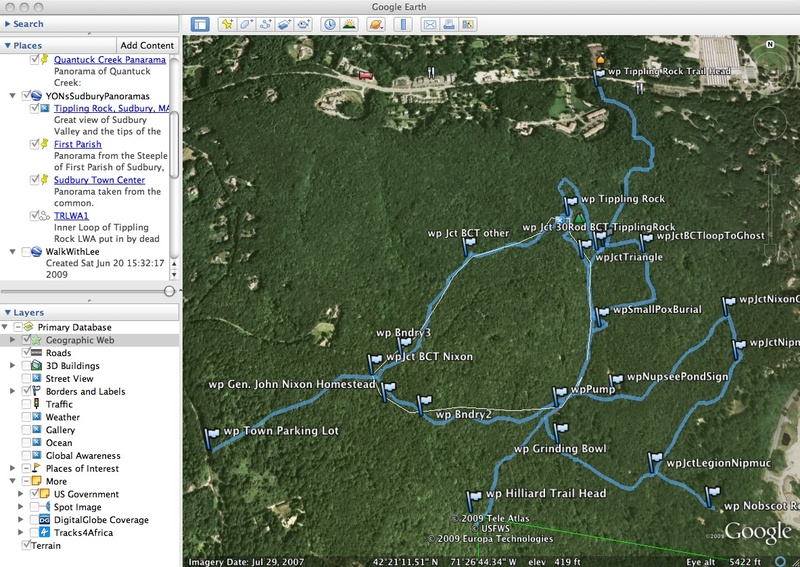 Dave Perry's GPS/KMZ maps featuring the SVT Nobscot Map as a KMZ overlay. They can be found on gpsfiledepot.com (Nobscot). Scroll down to the Download label. You can also see the solar array on the hill next to the transfer station. Hmm... time to update the hand drawn panorama. 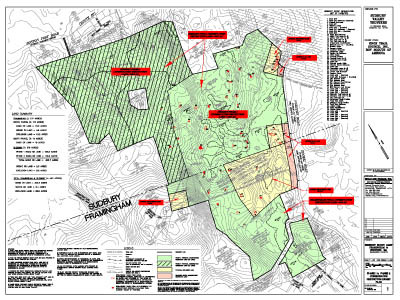 Also, close inspection show they flattened the top of Bear Hill in Waltham to build a gated community. Boston is fairly sharp, but the solar array is blurry. 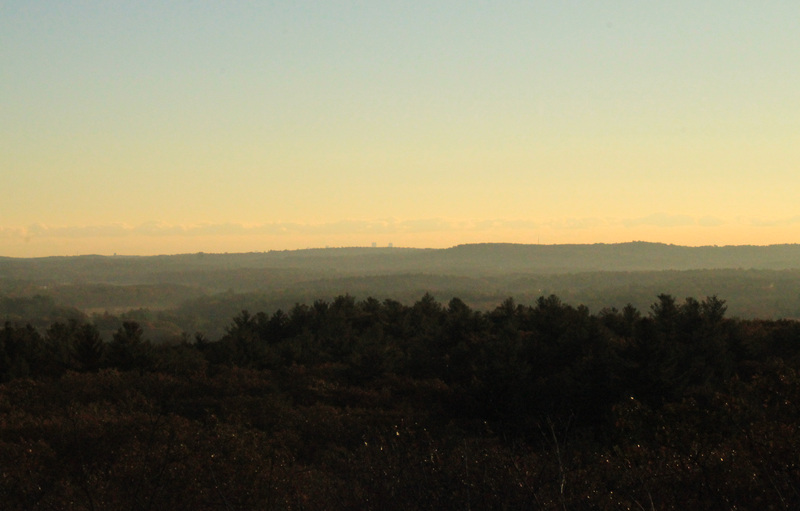 Sights, from left to right, solar panels, Great Meadows, Boston, Reeves hill, Great Blue Hills. I am working on a new verion of the map and would love feedback. Especially, do you download things into a GPS and follow them? What is the good and bad of that experience? Load this TipplingRockHiking20090627.GPX into a GPS or GoogleEarth. This may not be easy because .GPX seems to be a new dialect of XML. It should like like the image on the right. 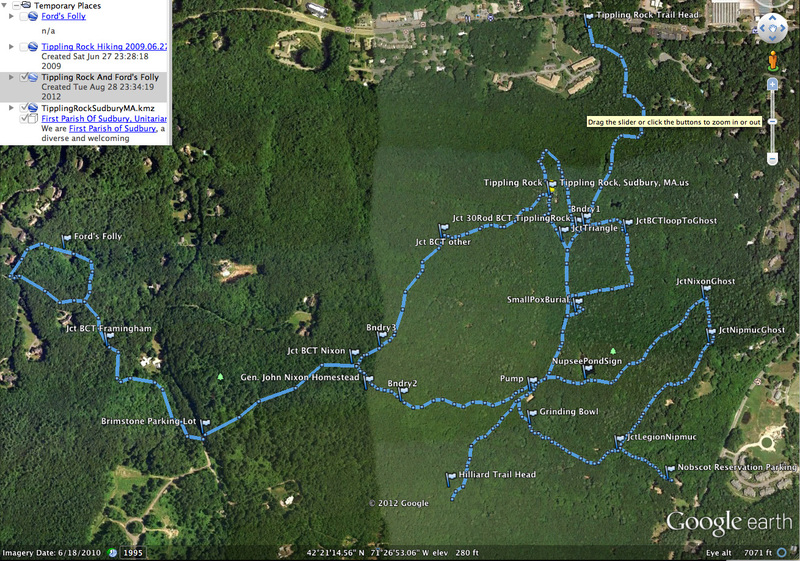 Also, same tracks and waypoints in a KMZ file. The map to the left is a tiny version of my 2001 map. Click on small image to get larger image. 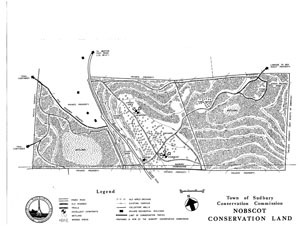 The prototype is pasted together from an NEOC map, a USGS map, with information taken from the Sudbury Conservation Commission maps and last but not least, a reasonably thorough exploration. I was laid off after 9/11 for a couple of months. To see the larger version (604KB) you can also click on the small map. For a few more bytes (1.6MB) here is TipplingRock.pdf. I do not have copyright for the NEOC and Boy Scout Maps, so, I made small versions of them to let you know they exist, but, you need to get real copies from them. 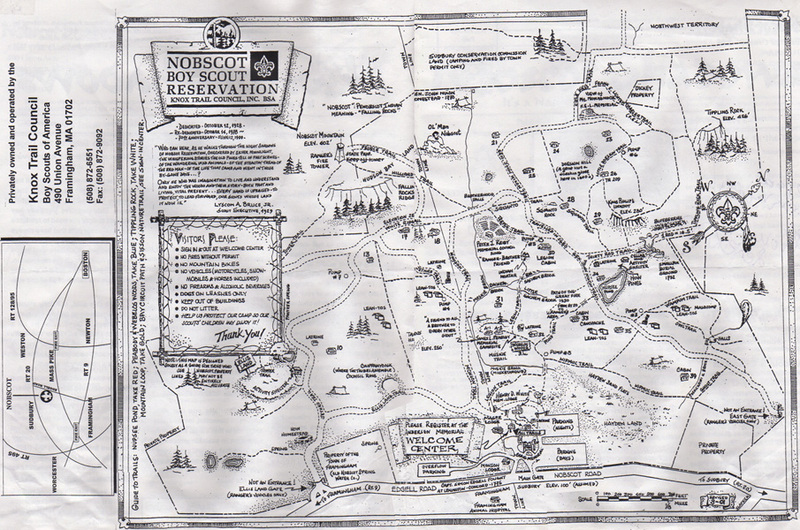 There are usually Scout maps available from White Lodge at the Boy Scouts parking lot. 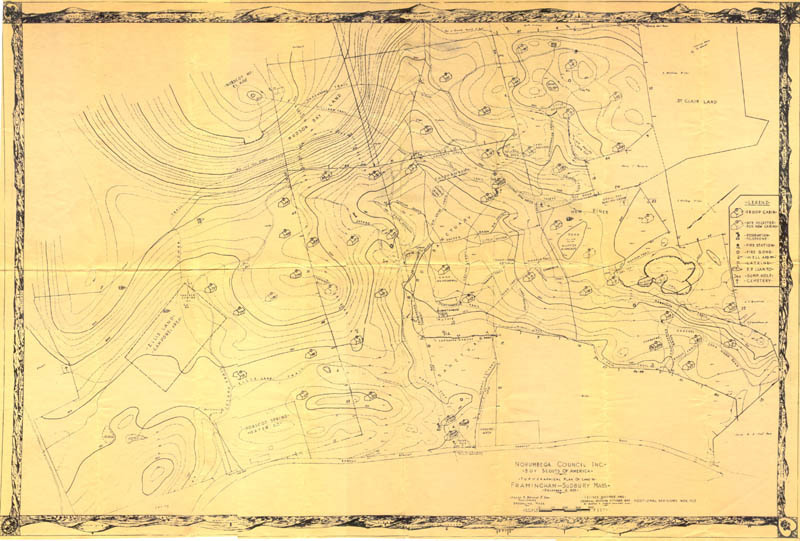 Also check out Historical Maps of Sudbury. Knox Trail Council of the Boy Scouts. Lots of Great Work ! ! ! Ranger Adam cleared the panorama in November of 2008. The panorama above, I had to take in 4 different panoramas and merge them. Cuts to the West and North West were also made. And now this spring (2009), STEPS!!! clear as a bell in it new cut! 20080408 - Sudbury votes to join, SVT and Boy Scouts to preserve Nobscot! 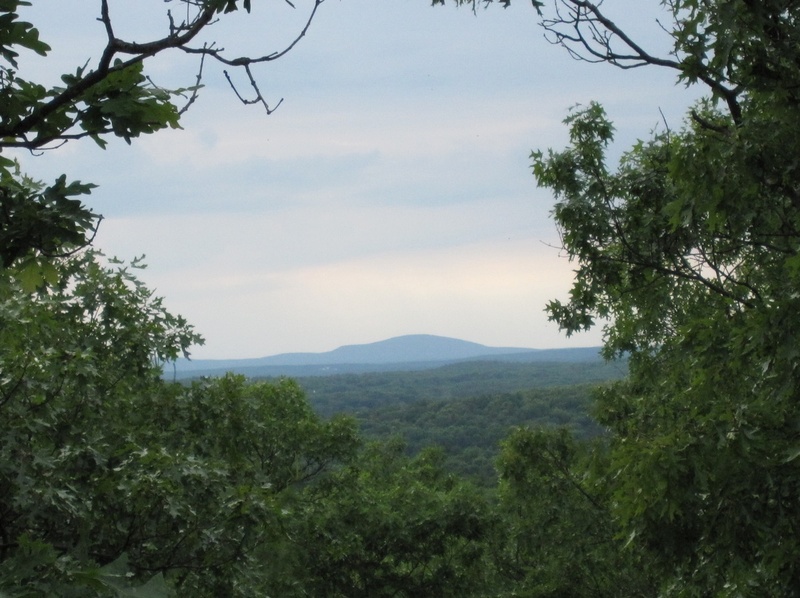 They announced a joint campaign to permanently conserve 300 acres including Tippling Rock and the surrounding area!!! See the announcement on the Sudbury Town Website. SVT is about 2/3rds (9/10ths on 9/10/08) the way thru a fund raising campaign to raise $350,000 from individuals like you and me. At the left is a very cool map that is linked to from the Town announcement - at the bottom of the page. It is PDF, so, you can zoom way in. Tippling Rock is in Phase 1. I have cached this as SVTNobscotPhase1_2.pdf.